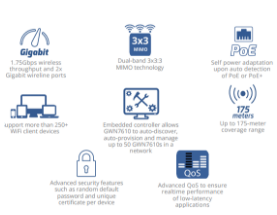 The GWN Series Wireless Networking Products – Secure, Easy and Powerful! 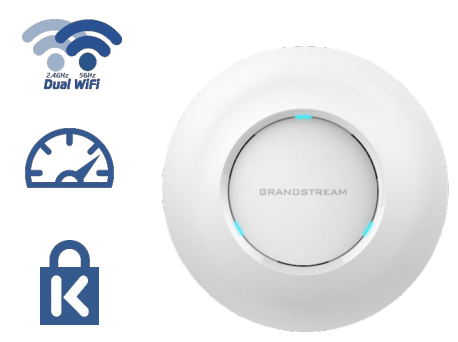 The GWN 7600 Series are the wireless access points (APs) that facilitate wired and wireless network access to large custom areas indoors. This series includes the GWN 7600 Entry-Level Access Point and the GWN 7610 Mid-Range Access Point. From small-sized businesses, multiple floor offices, to multiple branch offices, the GWN 7600 series has the right solution to cover all your needs, providing dual-band network throughput and expanded WiFi coverage range. With up to 175 meters range and over 250 concurrent clients access, the GWN 7600 series is a very powerful solution for commercial locations that have medium wireless network deployments with medium-to-high user density. 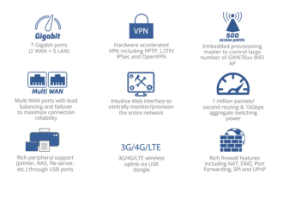 The GWN 7600 Series also features the Controller-less Management, an easy and centralized management through a single interface which allows each access point to manage a network of up to 50 WHN7510s or 30 GWN7600s/GWN7610s independently without needing separate controller hardware/software. What are the differences between the GWN7000 and the GWN7610? 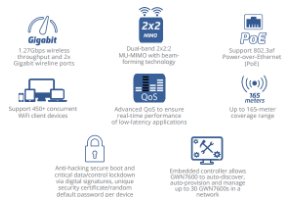 The GWN7000 is a feature-rich, powerful tool that supports WiFi and VPN solutions and can be shared across one or many different physical locations. With hardware-accelerated VPN client/server, the GWN7000 delivers secure, high-performance switching and routing for small to enterprise businesses. Even better, the intuitive web-based central network management even lets you control your system from any GWN7000 router. Embedded provisioning. 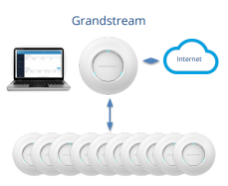 Can control up to 500 GWN76xx Wi-Fi access points. Seven Gigabit ports, 2 WAN and 5 LAN. Hardware accelerated VPN including PPTP, L2TP/IPSec and OpenVPN with speeds up to 300Mbps. 1M packet/sec routing & 10Gbps aggregate switching power. 3G/4G-LTE wireless uplink via USB dongle. Web interface to centrally monitor provision the entire network. Where are the Best Places to Deploy? Multi-floor office: Use multiple APs and SSIDs depending on how many floors the building has. 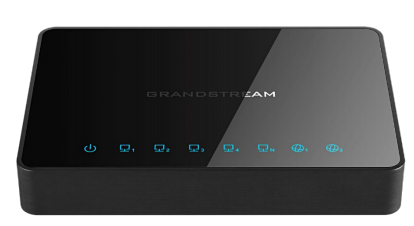 Multiple branch offices: Have multiple GWN7610s or GWN7600s linked through VPN (provided by the router). Download our full GWN series guide by filling out the form below! Also, join our upcoming GWN series technical training webinar on April 5th 2:00pm – 3:00pm to learn how you can manage the APs through the router’s interface, and much more. Register now!